Need to take the temperature of your cooking water, cold beverages or many other items This waterproof pocket thermometer by Fluke Electronics is small, discreet and can be used for a variety of functions. The digital read screen of this thermometer is straight forward and easy to interpret and the pen style of this thermometer means that it’s easy to store most anywhere. The 3 inch stem means that you can safely take the temperature of hot water, cold water, or even baked goods. This waterproof pocket thermometer is also field calibrated so you can be sure it worse precisely and the BioCote antimicrobial coat resists germs and bacteria build-up. There is also a data hold button for easy temperature recording for record keeping and consistency. 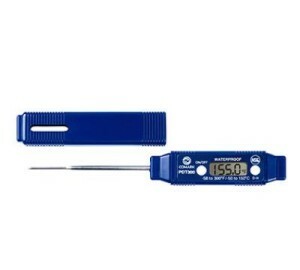 Make this waterproof pocket thermometer a part of your kitchen today! Waterproof Pocket Thermometer, digital, 3″ stem, pen-type, temperature range -58 to 300 F (-50 to 150 C), field calibrated, BioCote antimicrobial, data hold (D-H) button, NSF.